Do you have picky eaters in your house? My oldest will not eat meat besides pork and says she's a vegetarian even though she hardly eats vegetables and will scarf down a cheeseburger since her parents lie to her and say it's made with sausage. I would feel guilty about that lie but it gets her to eat all things ground beef since we just tell her it's sausage. She's in Kindergarten now so the clock is ticking very loudly on that big fat lie. I am constantly looking for new recipes that my kids will actually eat. 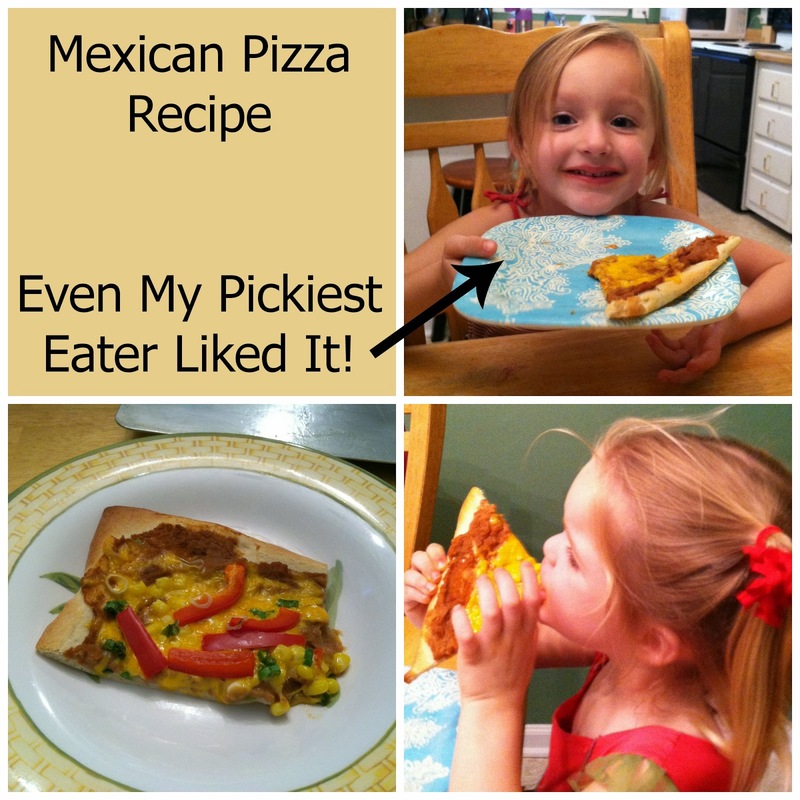 About a year ago I made my family black bean pizza and everyone loved it! That pizza gets put on the menu about every six weeks. Typically I have black beans on hand so I didn't think to check to see if we had a can in the pantry before I went to the store. Come dinner time a few nights later I discovered my mistake, we were out of black beans. Crap! This error had two outcomes; either we had to go to the store or order pizza. Well actually it had three outcomes since I decided that neither was a great option and I changed the recipe and winged it. My hope was that my kids would eat my new Mexican Pizza even though it had refreied beans on it which all of my kids hate. Yes we know they're weird, you don't need to tell us that. This recipe is fast! I love any meal that I can get on the table in under 30 minutes. Plus it's very versatile, you can change up the toppings to your family's preference. 1. Prepare your crust according to package directions. You need to cook the crust a little more than halfway done before you top it. I cook mine for 10 minutes even though the directions say 8 since I'm convinced the middle of the pizza never gets perfectly done in 8. Your call. 2. While your crust cooks mix the spices into the refried beans. A food processor does this for you fast! 3. Dice your bell pepper and onions. 5. Assemble the pizza; bean mixtures, cheese, bell peppers, corn, and green onions. My kids will not eat cooked bell peppers-only raw-so this is what our pizza looks like. 6. Cook the pizza for the remaining time according to your package directions. Mine says another 12 minutes. That's it, a very easy dinner than anyone can get on the table! I keep most of the ingredients on hand for a quick dinner on busy nights or when I just flat out don't want to cook since even Brett can make this simple meal. Trust me, if my husband can make it you can too! I hope you enjoy this quick and easy meal! Here are some other meals that you may enjoy.